In 2004, on a trip to the Czech Republic, we stopped in Jablonec nad Nisou, which is the center of glass bead and jewelry production for Europe. We normally go there to the factories to start production on our next line of beads for the new year, which we showcase at the big Tucson gem and mineral shows in February. On this trip, however, we investigated antique shops; since Jablonec is over 800 years old as a functioning town, and been in the glass production business, and specifically the glass bead business since the 1700s, it made sense to see what we could find hidden away and forgotten. What we found got us really excited. In a paper bag, on a shelf, I found approximately 100 jet-black glass medallions, in perfect condition, of a beautiful, side profile face, of a woman that could only be an original Alphonso Mucha design. 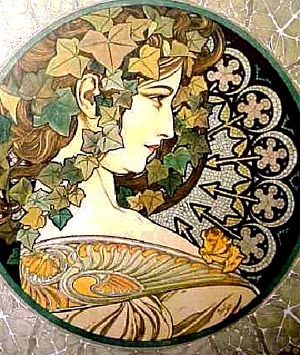 It was classic art nouveau from the turn of the 20th century. 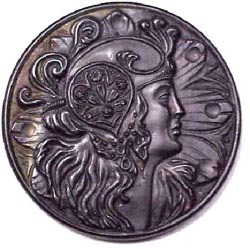 Approximately 2 inches in diameter, cast in glass, it appears to be from the zodiac series of Alfonsa Mucha. There are five indentations, which would suggest crystal rhinestones were meant to be embedded in the piece. 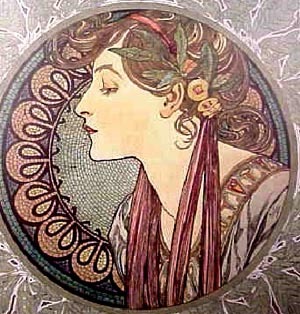 Alfonsa Mucha was born in Prague, Czech Republic, 1885  1935. He became famous for his art nouveau style of painting, in particular for his depiction of American actress Sarah Bernhardt. In talking to the shop owner, he only knew that the pieces were very old, and that they had been stored outside in metal buckets for decades, exposed to the elements. He also pointed out approximately 600 chocolate brown medallions that were identical to the jet black ones I had found on the shelf, but these brown ones were still sitting in the metal buckets, all rusted and filthy. I purchased the black ones, and we left. 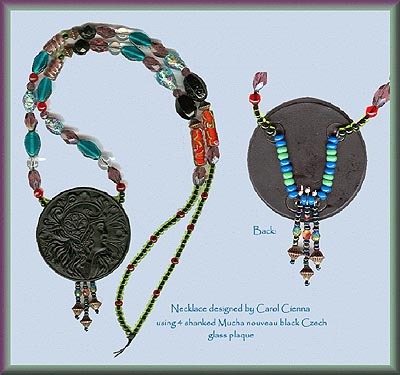 I thought about these medallions all night, and the next morning, while my wife went on to meet our factory rep to start placing an order for beads, I went back to the antique shop to purchase the remaining brown medallions. Once we got them home to California, we attempted to clean some of the brown medallions with bleach, coke, water, acid, kitchen cleaning products, you name it; but all we did was remove the rust and dirt from the glass. 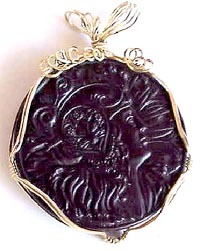 There remained an iridescent sheen over all or part of the medallions, which, although it didnt look bad, obviously marred the original medallion. A chance encounter with a very talented and somewhat famous bead artist, Laura McCabe, of Just Let Me Bead Studio, in Mystic, Connecticut, lead to an introduction to a group of archeologists in Connecticut who immediately took possession of some of the Medallions, and began a cleaning process using distilled water and a soft brush. They were horrified when they heard I had used all those cleaning products on the medallions. The rust that had begun attacking the glass is called vitrification, and it was eating huge holes into the glass. If the glass were not cleaned, eventually it would totally destroy the medallions. So although by cleaning the rust off the glass will stop further damage, nothing will be able to fix the damage already done to the pieces by the rust and acid rain from the air of the Czech Republic from all the decades of sitting outside in those metal buckets. 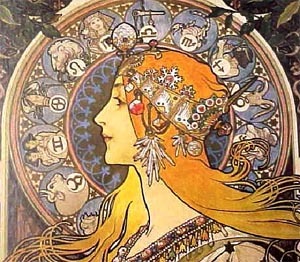 We contacted the Mucha Museum in Prague, which is run by a board of trustees, one member being the granddaughter of Alphonsa Mucha, but never received a response as to whether they recognize the work, or the actual piece in my possession. 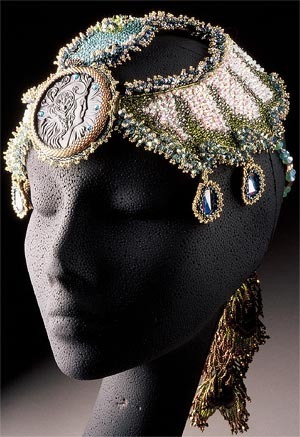 I do know that Mucha designed a line of jewelry, of which this could have been a part of, or it could have been something totally different, maybe something begun at the end of his career and never completed. (an unpublished work, for instance). Or, it could be another artists work, following in the style of Mucha, art nouveau, a copycat designer. Even so, it would be a hundred year old knock off art nouveau piece, and valuable in its own right. Examples of how it can be used. Wire wrapped by Shirley Hill. 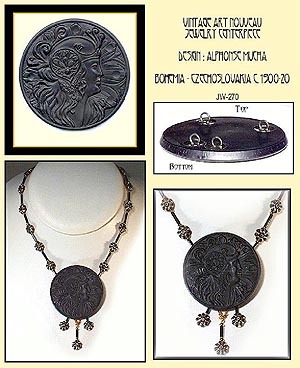 If anybody out there who reads this article, and views this piece, knows something about the medallion, I would really appreciate any comments or information relevant to identifying the piece, including valuation, age, artist, purpose for use, and especially photos of the original jewelry it was designed for. I can be contacted at Wild Things Beads, (530) 743-1339 or by e-mail, see link below.